The NewStar LCD Monitor Arm allows you to maximize the efficiency and productivity of your LCD Monitor. The LCD monitor arm can be adjusted in five different ways to increase the use of the screen and prevent RSI. 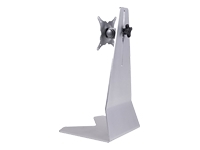 This LCD monitor arm allows to swing, lift, tilt and turn the LCD monitor for maximum efficiency and ergonomic comfort. This deskmount easily connects to the back of each LCD screen due to the VESA hole pattern.